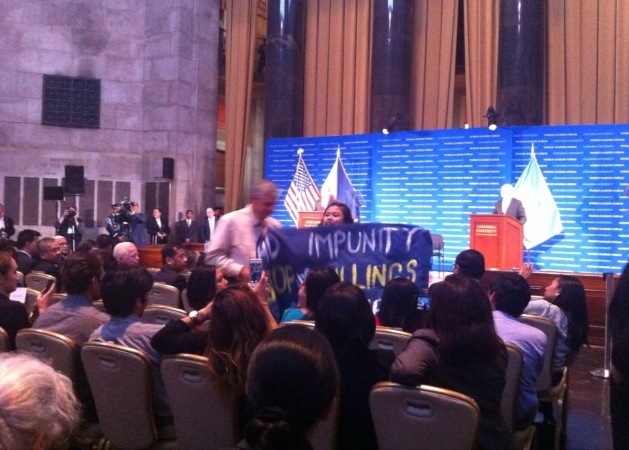 NEW YORK,USA- President Benigno S. Aquino was caught off guard during his speech at Columbia University when a Filipino-American activist stood up and interrupted him. Aquino was unaware of the presence of the members from Anakbayan New Jersey, New York Committee for Human Rights in the Philippines (NYCHRP), and Gabriela New York. Lingat questioned Pnoy on the pork barrel scandal, Typhoon Haiyan, and human rights abuses treated with impunity. On a press release by BayanUSA, Lingat related Aquino’s reaction prior to her being escorted by NY police. It was reported on GMA News that Columbia University president Lee Bollinger apologized to Aquino and said that although they value freedom of speech in the US, it wasn’t right to interrupt an academic forum that way. It was confirmed by Yves Nibungco, national chairperson for Anakbayan USA, that the activists present during President Aquino’s speech were not students of Columbia University. It was not, however, disclosed how the activists were able to find their way in since only students from the institution were allowed to register. Meanwhile, it was also reported by BAYANUSA that even after Pnoy left the university, protesters continued to rally outside the vicinity.